Contents. List of Contributors. Preface (I.L. Cartwright). A Perspective on In Vivo Footprinting (M. Nenoi and I.L. Cartwright). Genomic Sequencing by Template Purification: Principles and mapping of Protein-Bound and Single-Stranded Sequences in Vivo (J. Mirkowitch). Polymerase Chain Reaction-Aided Genomic Footprinting: Principles and Application (A.D. Riggs and G.P. Pfeifer). In Vivo Footprinting of the Interaction of Proteins with DNA and RNA (T. Grange, G. Rigaud, E. Bertrand, M. Fromont-Racine, M.L. Espinals, J. Roux, and R. Pictet). Characterization of In Vivo DNA-Protein Interactions in the Transcriptional Regulation of the Human Heat Shock Genes (L. Sistonen and R.I. Morimoto). Analysis of the Gata-1 Gene Promoter and Globin Locus Control Region Elements by In Vivo Footprinting 9E.C. Strauss and S.H. Orkin). Anazlyzing Hormone Regulation of Transcription by Genomic Footprinting (A. Reik, G. Schutz and A.F. Stewart). Photofootprinting Studies of SV40 Minichromosomes In Vivo (G.A. Grossman and M.M. Becker). Index. 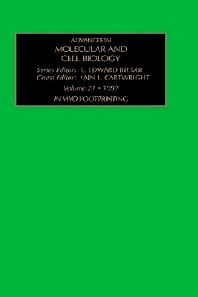 The revolution in biological research initiated by the demonstration that particular DNA molecules could be isolated, recombined in novel ways, and conveniently replicated to high copy number in vivo for further study, that is, the recombinant DNA era, has spawned many additional advances, both methodological and intellectual, that have enhanced our understanding of cellular processes to an astonishing degree. As part of the subsequent outpouring of information, research exploring the mechanisms of gene regulation, both in prokaryotes and eukaryotes (but particularly the latter), has been particularly well represented. Although no one technical approach can be said to have brought the filed to its current level of sophistication, the ability to map the interactions of trans-acting factors with their DNA recognition sequences to a high level of precision has certainly been one of the more important advances. This "footprinting" approach has become almost ubiquitous in gene regulatory studies; however, it is in its "in vivo" application that ambiguities, confusions, and inconsistencies that may arise from a purely "in vitro"-based approach can often be resolved and placed in their proper perspective. Put more simply, that an interaction can be demonstrated to occur between purified factors and a particular piece of DNA in a test tube does not, of course, say anything regarding whether such interactions are occurring in vivo. The ability to probe for such interactions as they occur inside cells, with due attention paid to the relevant developmental stage, or to the tissue specificity of the interaction being probed, has made in vivo footprinting approach an invaluable adjunct to the "gene jockey's" arsenal of weapons.